← What is Your Mouth Full of? This is an awesome study by John Ritenbaugh that I would urge you to read and reflect on its timely message. Paul lists nineteen characteristics, with “lovers of themselves” and “lovers of pleasure rather than lovers of God” serving as bookends containing the others within them. How can a person be faithful to God when he loves himself more than God? How can a person be faithful to God when his own gratification means more to him than pleasing God? How can a person be faithful if he is a headstrong, haughty slanderer and traitor who is disobedient to parents, greedy, unloving and without self-control? If anyone comes to Me and does not hate [love less] his father and mother, wife and children, brothers and sisters, yes, and his own life also, he cannot be My disciple. Faithfulness hinges upon what we value as important combined with commitment. Humans have a powerful tendency to be faithful to what they think is truly important, be it a family name, spouse, friendship, employer, school, athletic team or even certain things like a make of automobile. This tendency was an issue when the disciples decided to follow Peter’s lead and return to their fishing trade after Jesus’ death and resurrection. In John 21:15-17, Jesus pointedly asks Peter three times whether he loved Him. The first time He asks whether he loved Him “more than these,” referring either to his fellow apostles or the tools of his fishing trade. The inference is inescapable: Jesus wanted Peter to hold Him of greater importance than anything on earth. Considering Peter’s weighty responsibility, he could not be faithful to Jesus without the staunchest commitment to Him as most important of all in his life. Holding true to the course God has laid before us is difficult amid this world’s many alluring distractions clamoring for our time and attention. This world is attractive to human nature and bids us to expend our energies in self-satisfaction. Jesus warns all who take up their cross that the way is difficult and narrow, requiring a great deal of vision and discipline to be faithful to His cause. Some have completed the course. Those who held God and His way in the highest esteem in their lives are awaiting those of us traveling the path now. Will we be faithful as they were? “Faithfulness” does not even appear in the New Testament of the King James version (KJV). However, the idea certainly does in the Greek. In the listing of the fruit of the Spirit in Galatians 5:22, every modern translation renders the word that the KJV translates into “faith” as “faithfulness,” “fidelity” or “good faith.” In his commentary on Galatians, William Barclay writes, “This word (pistis) is common in secular Greek for trustworthiness. It is the characteristic of the man who is reliable” (p. 51). Faithful implies steadfast adherence to a person or thing to which one is bound as by an oath or obligation; loyal implies undeviating allegiance to a person, cause, institution, etc. which one feels morally bound to support or defend; constant suggests freedom from fickleness in affections or loyalties; staunch implies such a strong allegiance to one’s principles or purposes as not to be turned aside by any cause; resolute stresses unwavering determination, often in adhering to one’s personal ends or aims. Other synonyms include dedicated, steadfast, devoted, dependable, accurate, true, conscientious, dutiful, careful, scrupulous and thorough. Faithless means “not keeping faith; dishonest; disloyal; unreliable; undependable; unbelieving.” Its synonyms include doubting, treacherous and unscrupulous. The apostle Paul writes that “evil men and impostors will grow worse and worse, deceiving and being deceived” (II Timothy 3:13). People today are no different from when Moses wrote the Pentateuch or Paul his epistles, but the occasion to sin, the incentive to do so and thus sin’s frequency and intensity are at their highest levels since just before the Flood. In other words, the environment to commit sin more easily grows ever more amenable, and human nature is taking advantage of it. We have been born into—indeed have unwittingly contributed to creating—an environment in which it is exceedingly difficult to remain faithful. This world always appeals to moral and ethical standards lower than those of the great God and His way of life. In Technicolor with emotion-stirring music, Hollywood “sells” adultery and fornication as acceptable as long as the couple involved are attractive and somehow oppressed—thus “deserving” of a “better” relationship. War, murder, lying, stealing, coveting, Sabbath-breaking and idolatry are acts that almost everyone in the world would claim as being wrong, yet most unwittingly commit them to some degree and promote them in our culture. They justify their sin because everybody else is doing it, and they see no good reason why they should not just go along. If they try to swim against the tide, they think they will be taken advantage of. Not too long ago, a person’s word was his bond, and mere handshakes sealed major business agreements. Tales of Abraham Lincoln’s honesty over pennies are an almost legendary part of our nation’s history. Historians say that faithfulness was such a hallmark of the Roman Republic that not one divorce occurred in its first seven hundred years! But in the last fifty years this nation has seen a calamitous, family-destroying rise in the divorce rate that threatens the very stability of society. 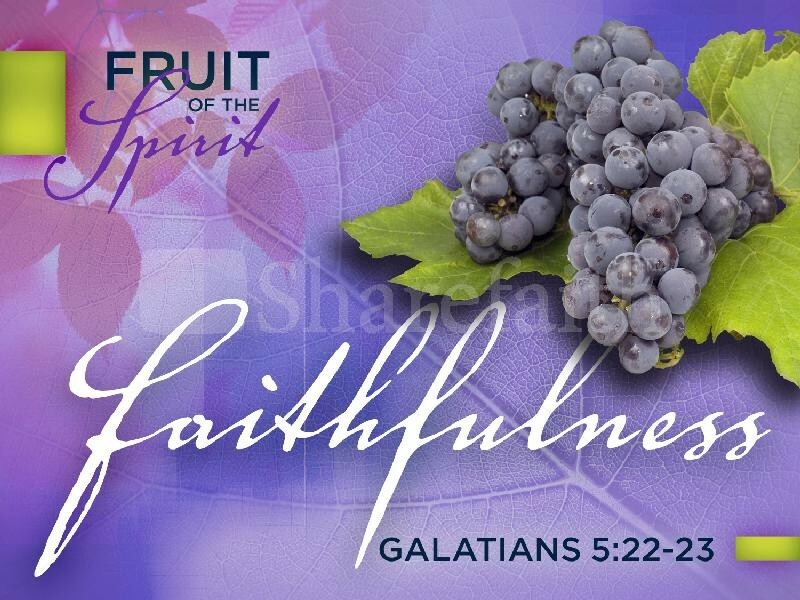 As with all the fruit of the Spirit, God Himself is the model we must study for examples of faithfulness to encourage us to trust and to emulate Him. The faithfulness of God is a familiar phrase to those of a religious mind, but its depth and scope are probably not as familiar. God’s faithfulness seems to have been a favorite subject of Paul’s. He writes of it in his first epistle (I Thessalonians) and again in what may have been his last (II Timothy). Paul had proved it in a thousand dangers and struggles; he found that, when all was said and done, God had never failed him. When we speak of one another as faithful, we mean that we adhere to our word, that we keep faith with men and that we discharge the obligations of our office or position. Because of these things, we are trustworthy. It is much the same when we think and speak of God’s faithfulness. Usually, the first idea that comes to mind when God is called faithful is that He keeps His promises. This, of course, is included in the concept of God’s faithfulness, but it is interesting that it appears only twice in the New Testament. In Hebrews 10:23, Paul exhorts, “Let us hold fast the confession of our hope without wavering, for He who promised is faithful.” Later, he writes that Sarah “judged Him faithful who had promised” (Hebrews 11:11). As God, He must be true to the character of goodness and wisdom that His very name implies. By contrast, a war goes on in us. Contradictory impulses and thoughts flood our minds. “For the flesh lusts against the Spirit, and the Spirit against the flesh” (Galatians 5:17), and we frequently lose the battle because the divine nature does not completely fill our minds. We blow hot and cold and drop below our best selves. No man is always himself, but God is always Himself! With God it is as the apostle John says, “God is light and in Him is no darkness at all” (I John 1:5). There is nothing in God to mar His faithfulness in carrying out His Word or His past acts. Our calling to Christ is one of God’s past acts. This means that what God has begun in us He will complete all the way to salvation (Philippians 1:6). When we die, He will have prepared us for a responsibility in His family Kingdom. Paul requests their complete sanctification and preservation as holy until they die or God finishes His activities on behalf of the church at Christ’s coming. Sanctification is the part of salvation that deals with our progressive growth in the grace and the knowledge of Jesus Christ—or put another way, to the measure of the stature of the fullness of Christ—or in yet another way, into God’s image. God is faithful in carrying out His part in the building of Christian character. God’s faithfulness guarantees the progressive perfection of a Christian’s life. He is not like men who begin a project, lose interest, run into difficulties, consider it too hard to overcome or become impatient and quit. He does not begin a work and then get disgusted with it and turn to something else. He does not begin and, finding He lacks the resources to finish, give up. Men do this, but God never stops until He is finished. He does not finish until He is satisfied. Jesus mentions the mocking of people who observe a person who begins to build but fails to finish (Luke 14:30). But the Scriptures say of God working through a man, “The hands of Zerubbabel have laid the foundation of this temple; his hands shall also finish it” (Zechariah 4:9)! There are no half-completed failures in God’s workshop. All we need to do is continue to yield. If we do, the cleansing, molding and perfecting of the saints that the patient and persistent Master Artist and Craftsman has begun will be completed. With this understanding of God’s faithfulness, we can then apply this principle to other areas of Christian life that are of practical and daily importance. By this we can be assured that He will deal with us in a patient, merciful, generous and yet persistent manner. Very early in the Bible appears a vivid example of God’s faithfulness that helped to perfect those undergoing trials: “Then God remembered Noah, and every living thing, and all the animals that were with him in the ark. And God made a wind to pass over the earth and the waters subsided” (Genesis 8:1). It is good to first consider that God’s faithfulness covers animal life as well as human life. He upholds “all things by the word of His power” (Hebrews 1:3). He does not simply create and then leave His creations to their own devices. His obligation to all life and its care and sustenance continues unabated. Though the words of this verse are few and simple, to those who feel lost in the depth of an ongoing trial a world of meaning lies here: We are not lost to God. Noah, his family and animals were virtually imprisoned in the ark for months, pitching about alone on an endless sea. Nothing broke the skyline. Noah could have easily thought himself as forgotten. Though he could remind himself that God had promised him protection, where was God now—now when the gray days and black nights dragged by and wherever he looked he saw only empty waters and a sky that seemed to hold no hope? God, however, did not lose track of Noah, and He will not lose track of us! The story of the Flood does not end on a note of hopelessness. The Flood abated. Mountaintops appeared, and the ark came to rest. Their physical survival assured, Noah and his family resumed life on an earth revived and cleansed of sin. God will never lay on us anything beyond our power to overcome. He knows how much pressure our hearts can stand. Do teachers give college-level assignments to a first grader and expect them to perform? Men are careful not to overload a truck, horse, mule or ox. Will God be any less merciful and faithful to us, His children He is creating in His image? He clearly recognizes His obligation to the work of His own hands to supply our needs and shape the burdens needed to prepare us for His Kingdom. Since Christ has come and died that we might be pardoned and cleansed, God’s faithfulness is part of His grace. He would not be faithful to His promises, His past acts in Christ’s works, or His calling that has sounded in our ears unless, when we obeyed the call and confessed, He allowed us to enter into the full possession of His pardoning grace. In other words, our forgiveness and cleansing, the receiving of favor from Him, is a product of His faithfulness. God’s faithfulness in these areas has far-reaching, practical ramifications for us. That God is faithful means that His character is unchangingly consistent. The unalterable structure of the universe consists of both justice and forgiveness. God never acts in contradiction of Himself, and in all experiences we may depend on Him to be unalterably just and forgiving toward us. Because He is faithful, He can be the central and most important object of our faith. Could we trust a god if we were never sure what he would do? This day the Lord your God commands you to observe these statutes and judgments; therefore you shall be careful to observe them with all your heart and with all your soul. Today you have proclaimed the Lord to be your God, and that you will walk in His ways and keep His statues, His commandments, and His judgments, and that you will obey His voice. Also today the Lord has proclaimed you to be His special people, just as He has promised you, that you should keep all His commandments, and that He will set you high above all nations which He has made, in praise, in name, and in honor, and that you may be a holy people to the Lord your God, just as He has spoken. Israel had been redeemed from Egypt, made a covenant with God and been told their responsibility. God makes it very clear that the relationship between Him and man is a two-way affair. Upon us devolves the duty of complete consecration and willingness to obey. We are called to faithfulness to Him and to each other as reflected in our lives by our keeping of His commandments. God on His part grants us access to Him by which He ministers great blessings of His Spirit, giving us the means to be faithful. God calls upon the church to succeed where Israel failed, yet currently, the Church of God is badly divided and so widely scattered that it can almost be called shattered. Surely this derives from the unfaithfulness in attitude and conduct reflected in the past 25 years of the church’s existence. Leviticus 26:33 clearly shows that scattering results from faithless commandment-breaking, and a vomiting out of the mouth (another metaphor for scattering) is evidence of inconsistency and instability of attitude. We have not held faith with our covenantal responsibilities! Jesus proclaims in Matthew 25:1-13 that in the time immediately preceding His return in all the power and glory of God, His church will have gone to sleep and faithlessly allowed its oil to run low. Is that the attitude of faithful stewards of the mysteries of God? We are all guilty because, as the parable shows, all ten virgins went to sleep. But even as all ten slept, it is also possible that all ten can repent. What is the attitude, or what qualities in us should correspond to the faithfulness of God? Paul writes in Hebrews 10:23, “Let us hold fast the confession of our hope without wavering, for He who promised is faithful.” Holding fast is the first indication of faithfulness, but our understanding increases when we know the word translated “faithful” is the same word translated “faithfulness” in Galatians 5:22. It is understood as “reliable” or “trustworthy” rather than “fidelity” because it is being fully convicted of the truth of God that engenders loyalty and dependability. Faith in God corresponds to God’s faithfulness. As with two tuning forks of the same pitch, when one is struck, the other responds by vibrating also. God’s faithfulness should awaken faith in us, so we can respond in submissive obedience. If He is worth trusting, we should trust Him. Therefore, when I was planning this, did I do it lightly? Or the things I plan, do I plan according to the flesh, that with me, there should be Yes, Yes, and No, No? But as God is faithful, our word to you was not Yes and No. For the Son of God, Jesus Christ, who was preached among you by us—by me, Silvanus, and Timothy—was not Yes and No, but in Him was Yes. Similarly, Paul states that his, Silvanus’ and Timothy’s declarations, their preaching about God, were also faithful, unvarnished, unexaggerated and uncolored. They did not change the truth or shade it in any way. Jesus says He came into this world to bear witness to the truth (John 18:37). Paul felt he was under sacred obligation to do the same and maintain a character of the strictest veracity in every respect. Perhaps our greatest obligation on earth is for us to imitate our Redeemer’s faithfulness. It does not become an individual who professes to trust in the faithful God to be shifty and unreliable in word and deed. Considering the context, this instruction tells us that it is the faithful Christian who will be ready for Christ’s coming. He will be ever alert to the times in which he lives and will pattern his life accordingly, making effort to be found faithful. Verse 47 promises God will reward the faithful for these efforts. Because God is faithful, the strength to be faithful is promised to us. Hebrews 4:16 assures us, “Let us therefore come boldly to the throne of grace, that we may obtain mercy and find grace to help in time of need.” Forgiveness, access to His throne, and the promises of His Spirit and that no trial will be greater than we can bear—combined with His declaration that He works in us both to will and to do—assure us that this fruit of the Spirit can be produced in us when we yield as faithful servants. This entry was posted in Bible Teachings, Inspirational Messages and tagged do you love me more than these, faithful, faithful as Christians, faithfulness, faithfulness as fruit of the spirit, faithless generation, first love, fruit of the spirit, love for Jesus, love of the world. Bookmark the permalink.